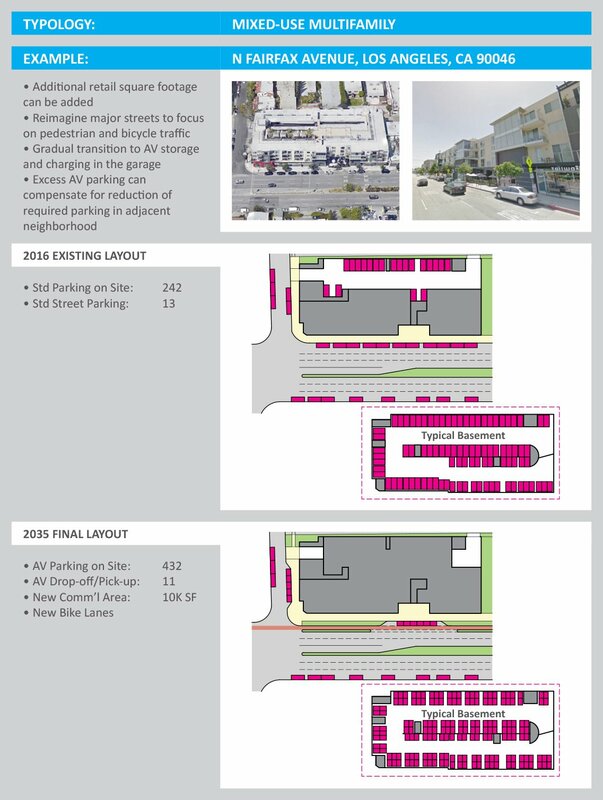 This is a preliminary study of how, in the future, self-driving electric cars, aka Autonomous Vehicles (AVs), will affect the existing architecture and urban infrastructure of American cities. While much current media attention is focused on the technology and manufacturing of AVs, there is less news about how cities can encourage and benefit from their mass adoption. How can we idealize public space and private space for the average citizen? How can we utilize economic levers to spur community needs? How will architecture, zoning, and planning change with the adoption of AV technology? 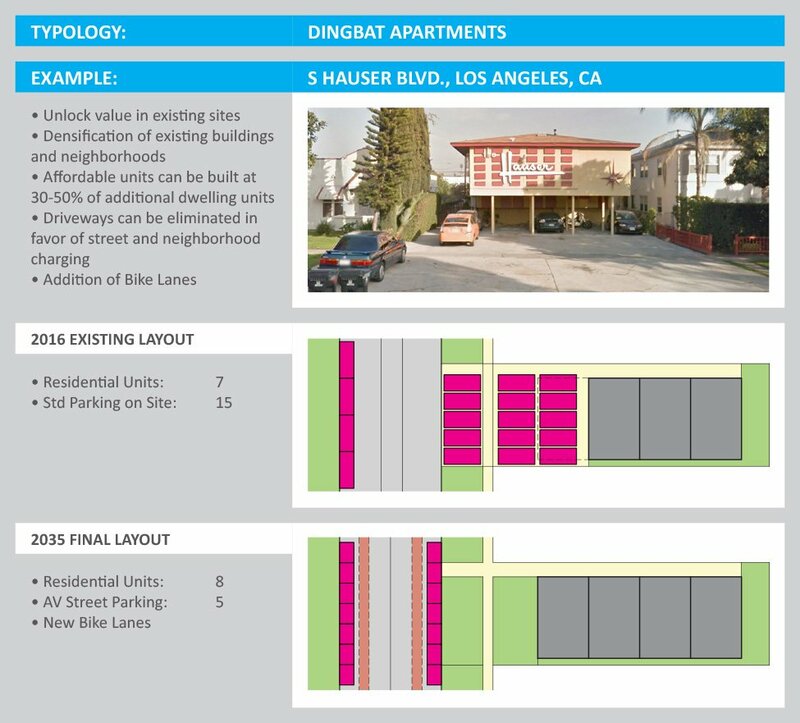 To begin our research, we have analyzed recurring architectural typologies in the Los Angeles region for how a critical mass of shared AVs can enhance the form of buildings and open space by the anticipated reduction of space allocated to the storage of vehicles. 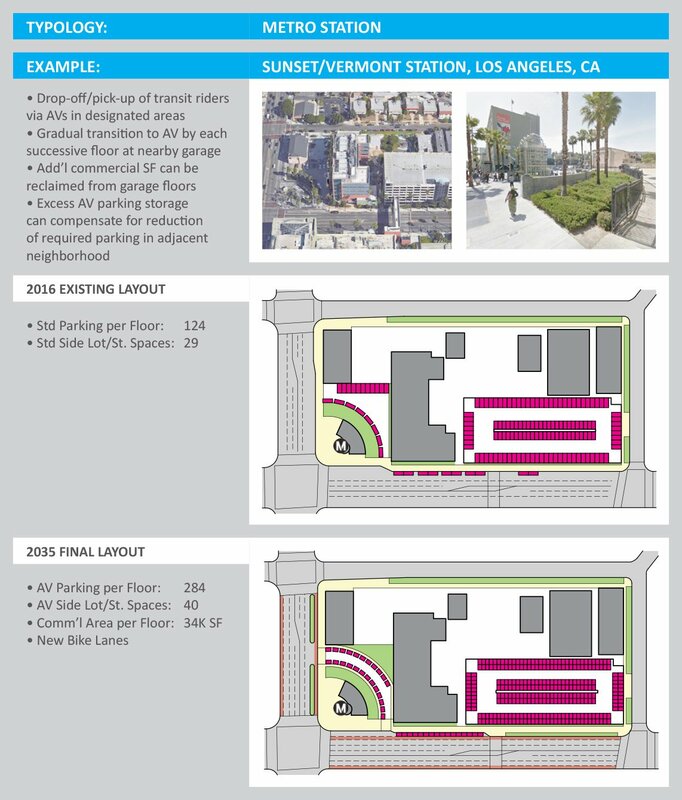 The American Planning Association discovered that, in 2010, 14% of LA County land was being used for parking, with an estimated 200 square miles being taken up by 18.6 million parking spaces. 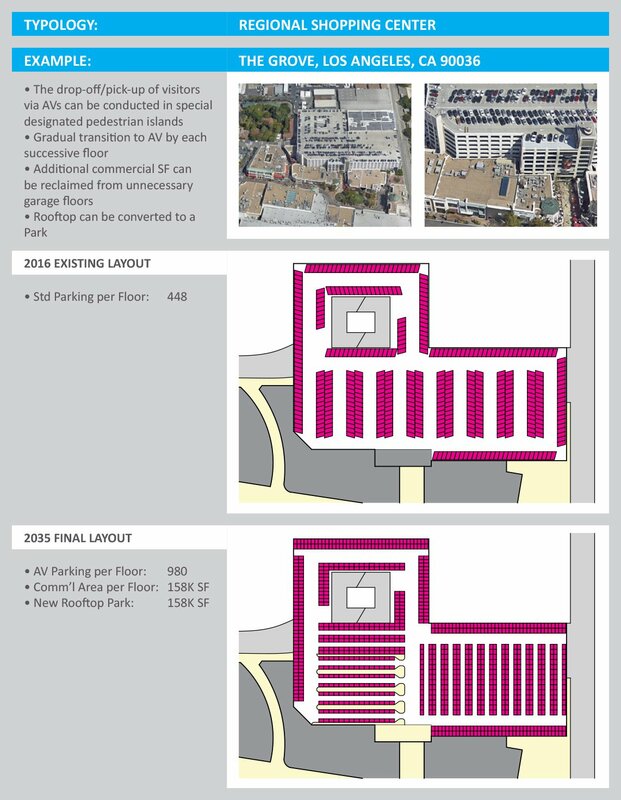 For reference, that’s 1.4 times more land devoted to parking than to streets and freeways (Curbed LA). Though cars are currently parked for 95% of the day, shared mobility would demand the stowing of vehicles only for maintenance and charging. 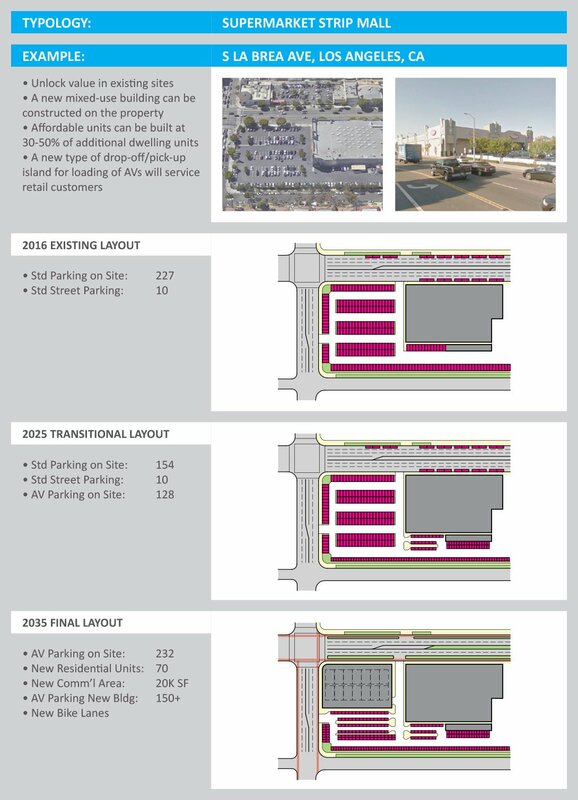 Over the next 20 years, the gradual adoption of AVs will encourage the majority of former parking space to be reallocated for densification projects, to include urban needs such as affordable housing and high-quality public spaces. Departments of City Planning should proactively strengthen their policies and regulations to support this densification. There is a historic opportunity to incentivize private development to reimagine properties for a denser, shared mobility, future. 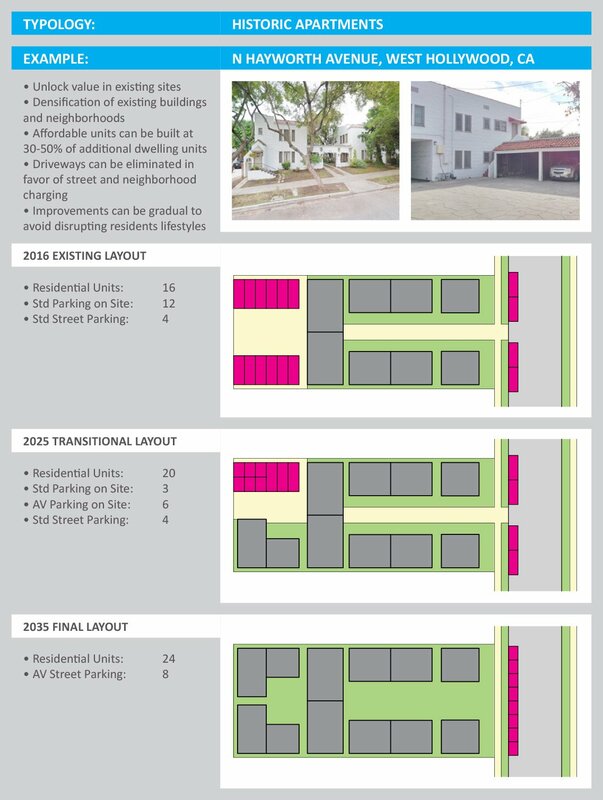 Gradually, driveways, garages, and parking lots, will be replaced by denser, more diverse, and walkable neighborhoods. AVs will be able to find parking spaces and charge without human interaction. A typical AV would be the size of a 2-seater GoogleCar, Car2Go or SmartCar. There will still be needs for delivery vans, professional service vehicles, and minivans. This study considers the majority of AVs to be shared, operating continuously (though there will likely be some level of private ownership of AVs). Shared AVs could be used for any activity such as shopping, commuting, or accessing transit, and can be summoned or reserved for periods of time as necessary per user. Mobility provider options could include monthly, daily, or distance based plans. High Capacity mass transit systems would need to be built as planned in conjunction with AV technologies over the next 20 years. According to a study by the International Transport Forum, a 44% reduction in vehicular traffic can be achieved if the two transportation options are linked. Government policies would discourage operation of private standard vehicles. “Mobility Providers” would be responsible for their own contracts regarding maintenance areas and vehicle charging. 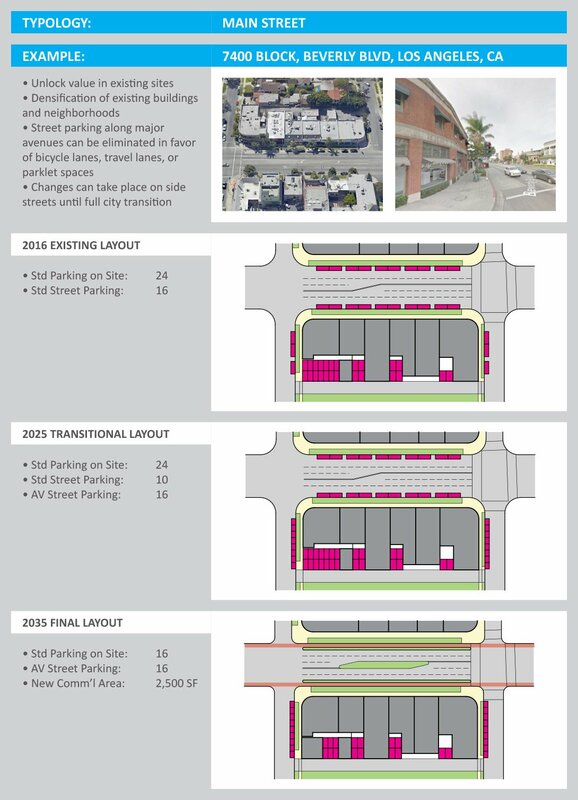 This study does not consider these economics, but assumes they would pay fees to use city-owned land for on-street parking or pay to use private parking garages.